The boys at Machine 7 have been in touch, to let us know that they are determined to keep their super fast delivery service during the current Royal Mail strikes. As such, all internet orders placed during the strikes are being upgraded to courier shipping at no additional charge. Don’t forget, they ship all orders of just £25.00 carriage free, so this really is a killer deal. FRANKFURT (Reuters) – Volkswagen is offering to save Germany’s Karmann from going bust, but the contract carmaker’s owners are demanding more money than VW is willing to put up, weekly Spiegel reported, giving no details of its sources. Without fresh funds, the German independent contract carmaker and convertible roof-top specialist, will have to shut down in early November as new orders remain scarce and customers remain unwilling to pay their bills. Volkswagen has bid a low double-digit million euro sum for Karmann, whose owning families Battenfeld, Boll and Karmann are demanding almost 100 million euros ($150 million), Spiegel said in a preview of an article to be published on Monday. Volkswagen, Europe’s biggest carmaker, declined to comment on the matter. Most famous for the 1950s VW Beetle-based coupe dubbed the Karmann Ghia, Karmann also developed the retractable hardtop roof first introduced with the Mercedes-Benz SLK before the idea was later copied by competitors, finding widespread use in popular volume models like the Peugeot 207cc. 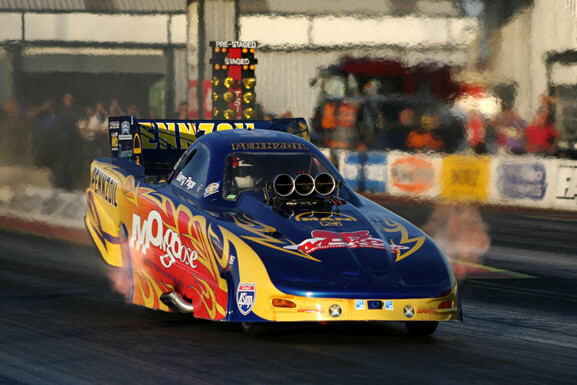 Santa Pod Raceway, the home of European Drag Racing has just released its full 2010 calendar. In-keeping with previous seasons, Santa Pod offers something for everyone throughout the year, mixing classics, modified metal, bikes, music, fireworks and of course racing! Lots and lots of racing!!! Basically, if you enjoy a great day out, there’s bound to be something there you’ll love. Best of all, in these credit-crunching times, kids under the age of 16 get in for free at almost all of Santa Pod’s major events throughout the year, so taking the clan needn’t mean breaking the bank! Best of all, the ‘Pod team has frozen prices for all of its own events at the ’09 rate! Show highlights include February’s Stunt Night on the 19th, where the cream of European automotive performers and artists wow the crowds. March the 21st sees the hugely popular Fast Show and the 11th of April offers the GTI Spring Festival, for those who like their cars loud, proud and quick! 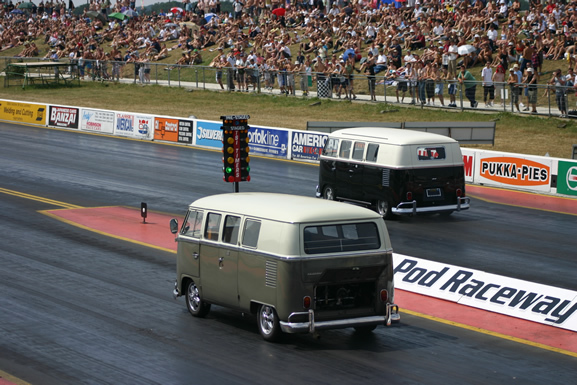 April’s Easter Thunderball (2nd – 5th) showcases the finest in European Drag Racing and the Big Bang Camper and Bus Show from the 23rd to the 25th is perfect for those who prefer their VWs old – and comfy! Fans of all years of modded metal will love the PTM show on the 9th of May and there’s more stunt based japery abounds for the May Bank Holiday. 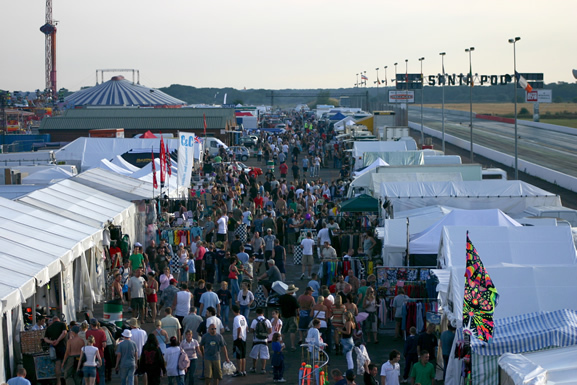 In fact, May’s a busy month at the ‘Pod, as the host venue for the FIA European Drag Racing Championships between the 28th and 31st. If you want to see just how fast cars and bikes can really cover the quarter mile, get a ticket, quick! 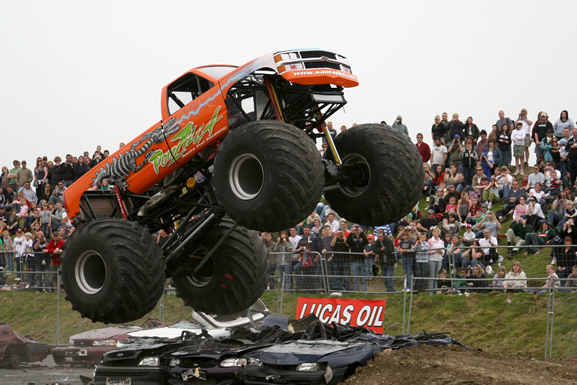 June sees the Summer Nationals on the 19th and 20th for quarter mile fans to get their fix and also hosts the UK Truck Show, – both being a cracking family weekend away. July sees Japshow on the 4th and of course, the legendary Bug Jam , now in its 24th year, between the 23rd and 25th . August brings the unstoppable party that is Ultimate Street Car between the 6th and 8th whilst September hosts classic VWs once again for VW Action on the 3rd, 4th and 5th. Drag fans will also love September’s National Finals between the 9th and 11th, and Jap fans who didn’t get enough in June can visit the Japshow finale on the 3rd of October. Finally the year ends in a bang with the eyeful that is Flame and Thunder on the 30th of October and the Fireworks Frenzy on Bonfire Night. With its central location, warm welcome and superb facilities, make sure you get to the Pod at least once in 2010. With the most eclectic mix of events in the UK scene, it’s hard not to find something you love! See you there! 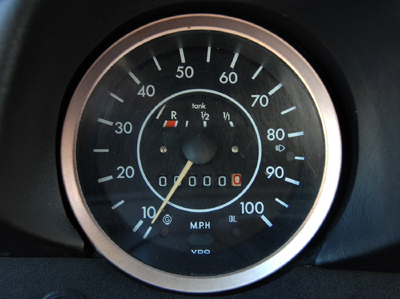 Effingham, IL (October 19, 2009) – Mid America Motorworks, marketer and manufacturer of Air-Cooled Volkswagen parts and accessories, today announced the addition of Rebuilt Volkswagen Speedometers to their product line. This product is an OEM VW speedometer that has been completely disassembled and inspected for damaged or missing parts. All internal parts are cleaned and lubricated or replaced as needed. Each unit is recalibrated back to factory specifications. Cases are soda blasted and clear coated for years of shine. The glass and chrome trim are both replaced for high luster and new pointers are used on each unit. All warning light filters are replaced. 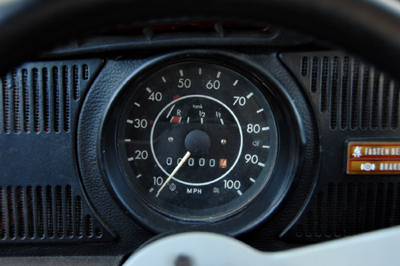 As a VW owner and enthusiast myself, I found the need for quality rebuilt speedometers. Looking at the possibilities, we found one of the best restoration builders who met our quality requirements and we are happy to offer this product to our customers,” said Josh Yager, VW merchandiser at Mid America Motorworks. The Volkswagen Speedometers are shipped directly from the manufacturer within 7-10 business days with prices ranging from $229.99 to $279.99 depending on the year. Mike Yager’s infatuation with the Corvette started it all. What he created from his passion for “America’s Sports Car” in 1974 has grown into not only an astonishing business story, but a lasting legacy to legions of car lovers worldwide. In 1998, the Air-Cooled Volkswagen line was introduced by Mid America Motorworks. Mid America Motorworks has been a labor of love since 1974, when he started the business with a $500 loan and a collection of Corvette parts and accessories he sold from the trunk of a borrowed car. Today, Yager refuses to use titles like “president” or “founder.” His title is “Chief Cheerleader” because he believes his primary responsibility is to lead and motivate his employees who have enabled Mid America Motorworks to grow and become so successful. Today, the multi-million dollar enterprise is dedicated to the automotive enthusiasts. Through full-color mail order catalogs and the Internet, it offers thousands of parts and accessories for Corvettes and Air-cooled Volkswagens. Still solely owned by Yager, the company now employs close to 100 people, manufactures a growing line of its own quality interior products under the Performance Choice brand name, and fills thousands of square feet of office, distribution, warehouse, manufacturing, and retail showroom space at its corporate campus in Effingham, Illinois. Staffordshire County Showground, Weston Road, Stafford. BusFreeze is just around the corner and smart VZi readers will be interested to learn how they can get their hands on both a FREE show pass and a FREE camping pass. More about this later. BusFreeze is a trade and exhibition event that celebrates the world’s first people carrier and it takes place at the Stafford showground on Sunday 1st November 2009. Camping is available, if you’ve got the right credentials or the power to twist an arm. It costs a lousy £5 per vehicle to camp (make even more friends in tight spaces and save!) and £10 per adult to get in. If you’ve booked an autojumble stand, good on you! We’ll throw in a free camping pass so you can unload on Saturday. There’s a whopper of a website in glorious Technicolor to guide you through it all. 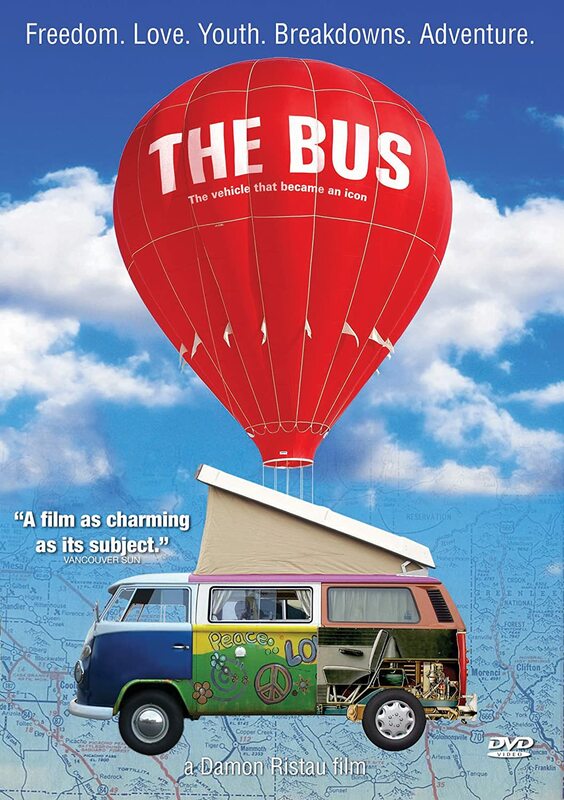 Take a peek at: www.busfreeze.co.uk and download the event programme and the Vehicle for Sale pass that’ll get you in the sales area for nothing. Prepare yourself for the specialist demos that are taking place in the main buildings (Stateside Tuning, Volksgoods, Dbeilt… to name just a few) and preview the registered show and primers. So, you want a BusFreeze show and camping pass for free, do you? Smart move. Sign-up to receive the online Freeze newsletter because with every latest online issue we give away a show and camping pass to one of our loyal Freeze readers, and if you’re a little late and only reading this after the event, fear not because there’s always next year. From 1st of October VZi Major Sponsors Machine7.com are offering FREE DELIVERY on Web Orders of £25 and above for Mainland UK delivery. With their superfast and efficient despatch and fantastic customer service you can be sure you will not be left twiddling your spanners…. They have also been working hard to reduce prices and have used their expert knowledge of show and daily used aircooled VW’s to create some fantastic website only bundle offers. These bundles include all the products you need to perform very common maintenance and modifications at the simple press of a button. These even qualify for free shipping if they are over the £25 threshold. They currently have around 50 bundle options online with another 40 that will be gradually introduced through the winter, so be sure to check back at Machine7.com on a regular basis….support those who put some back! Can’t be bothered taking the stairs or putting your rubbish in the bin (writes reghardware.co.uk)? You might change your mind when you see how electronics have been used to create a set of musical stairs and a ‘bottomless’ bin. Car firm Volkswagen recently teamed up with some designers to transform a set of steps at a subway in Stockholm into, well, a giant musical keyboard not too dissimilar from those played by Tom Hanks in flick Big. 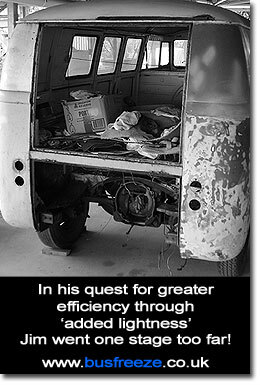 Retired English professor living in Wimberley misses the classroom, but he finds car restoration stimulating. You have to be in the know about John Bowman’s passion when he admits he’s “crazy” about Iris, and it’s OK with his wife, Kay. Iris is the Bowmans’ 1978 Super Beetle — the upscale model of the regular Beetle, with a bigger trunk, nicer wheels and upgraded bumpers, dash and upholstery — that has been undergoing restoration in his garage all summer. It was a gift Bowman gave his wife for her birthday and their anniversary earlier this spring. Now, the blue Volkswagen once owned by a little old lady in New York is a lot of work. John Bowman bought a 1978 Super Beetle on eBay from an elderly woman in New York and gave the vintage car to his wife for her birthday and their anniversary in the spring. Since May, he's been in the garage restoring the upscale model of the regular Beetle, and he hopes to take his wife, Kay, out for a spin this fall in the finished product. The VW is the couple’s way to relive the good old days of the 1960s and 1970s at the University of Texas. They hadn’t met, but both drove VWs. He was a bit of a hot-rodder then. He owned several muscle cars (not at the same time), including two Pontiac GTOs and a Chevrolet Corvette. “My 1969 Beetle was easier on gas and insurance,” he said. And he stopped getting speeding tickets on South Congress Avenue. “Those were the days — going to Scholz Garten for a pitcher of beer,” Bowman said. Back to reality and the more docile life of retirement in Wimberley and the very cute Iris. This is not Bowman’s first rodeo with restoring cars and trucks. The retired English professor has restored a 1970 Ford F-100 that he sold back to the original owner when the owner’s grandson was ready to drive. “That was our agreement. I kept it for a while until the boy was ready to enjoy a truck driven by his grandfather,” said Bowman, 65. In his driveway today is a 1978 Ford F-150; in his garage is a 1993 Ford Lightning, a high-performance show truck, with 3,800 originalmiles on the odometer that he found on eBay. Bowman found Iris on eBay, too. “It’s from the original owner, a little old lady outside from Hamburg, N.Y., so the story went,” he said. Bowman snagged it and had it delivered on a trailer in May. He’s been tinkering with it ever since. He makes clear that he’s not a mechanic or expert in restoring cars, but he mentions that he can understand manuals and “figure” things out. It took him all summer to remove the rust from the floor pans and metal heater channels from the engine to the cab of the car. “I sanded the pans, applied Rust Stop paint and then applied fiberglass. Then I cut out Dynamat (sound proof material made of aluminum) and added new carpet on top,” he said. Cleaning every inch of the car was paramount. Nothing that Armor All (an interior cleaner), Simple Green (a degreaser) and Gunk (an engine cleaner) couldn’t handle. “From there, it’s just getting on your hands and knees and cleaning every part,” he said. The engine is mechanically sound. Next up are the finishing touches that Bowman will enjoy adding: fender skirts, vintage VW mud guards, new chrome wheels with baby moon hubcaps and white wall tires. He went online and found vintage VW stores and people from all over the world who sell individual parts.The trademark small, ornate vase from a person living in Germany will go somewhere on the dashboard. A faux Iris will be placed there. He finds the work stimulating. “I love the fact that I come up against something that doesn’t work, but then I figure out how to fix it. I miss the mental challenge of the classroom, but this work gives me a good feeling,” he said. The Bowmans say they can’t wait to drive Iris daily sometime this fall. “Taking the top down, driving it around these hills,” he said. “That’s good therapy. And the sense of accomplishment that I didn’t spend $30,000 by taking it to a custom shop. A MIDLAND funeral firm is offering Volkswagen fans the ultimate send-off – by using a VW hearse. Clare Brookes and business partner Michelle Orton, both aged 35, created the hearse when they launched their unique funeral van three years ago. The Atherstone-based pair, who are VW enthusiasts, spent £8,000 restoring it and following the company’s first funeral in December 2007, business has been booming. It’s believed to be the only aircooled funeral fleet in the world. Clare and Michelle also offer bereaved families the choice of 3 stretched Beetle Limousines and bus/camper van fleet for funeral hire. Clare said: “I have always loved VWs and so I thought to myself, ‘What would I like to go off in?’ I just thought, ‘Stick me in a camper van’. Her family are funeral directors and have a wedding car company so this was a natural progression. “If that’s what I’d want, I thought there had to be a market out there. “Our Hearse was born in 1972 and was a Mortuary body removal vehicle, so it was already a hearse. “we fully refurbished the exterior and interior and installed a coffin beir.” The van, which has hire charges starting at £400, has been used for more than 40 funerals nationwide. Clare said: “People will naturally interact with the van and touch it. It also breaks down the barriers and gives people something else to talk about at a funeral. “While many families continue to prefer traditional funerals, an increasing number are now changing traditions in many ways. Nichola Green, who used the VW hearse for her father’s funeral said: “When my dad Brian passed away suddenly earlier this year my family were looking for a funeral service with a difference and which reflected him as an individual. “Dad had seen the hearse at a classic car show and thought it was a great idea but we didn’t think we would be calling upon it quite so soon. * The camper will be on display at the Classic Motor Show, running from November 13 to 15 at the NEC.